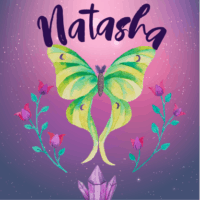 Setting daily intentions and practice gratitude are key to experiencing an uplifting, joyful day and manifesting the life you want, but it can be difficult to remember to consciously set an intention each day when your morning is busy. I’ve found that a visual reminder right on my desk really helps me, which is why I created this daily intentions planner page. 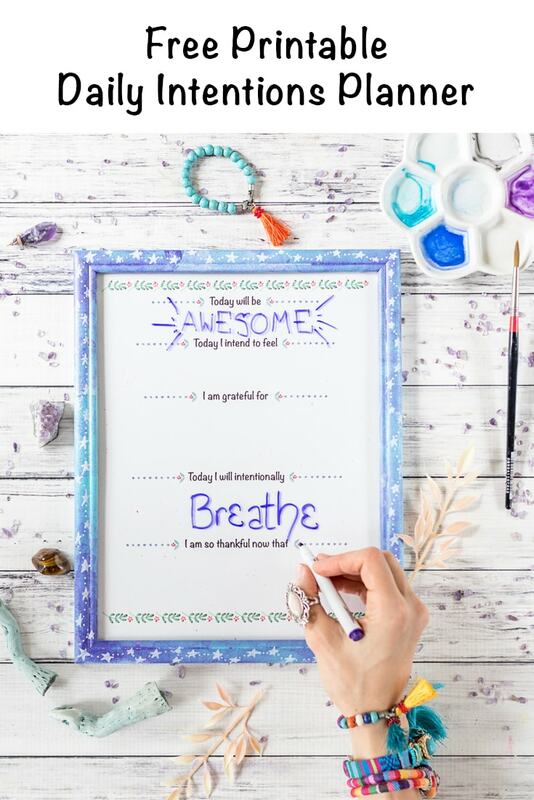 I am so excited to be sharing this free printable daily intentions planner with you all today along with tips on how to make a super easy DIY dry erase board so you can use your printable over and over! I know it’s helped me stay on track with my intentions, affirmations, and gratitude. I hope it helps you, too. It’s unbelievably simple to make! Literally all you need is a picture frame with a glass front. I used an 8.x5x11″ picture frame that’s meant to hold an award certificate. You could also use an 8×10 picture frame – I’m providing the intentions planer printable in both sizes! If your frame is kind of uninspiring, like mine was, you can easily fancy it up with some paint! 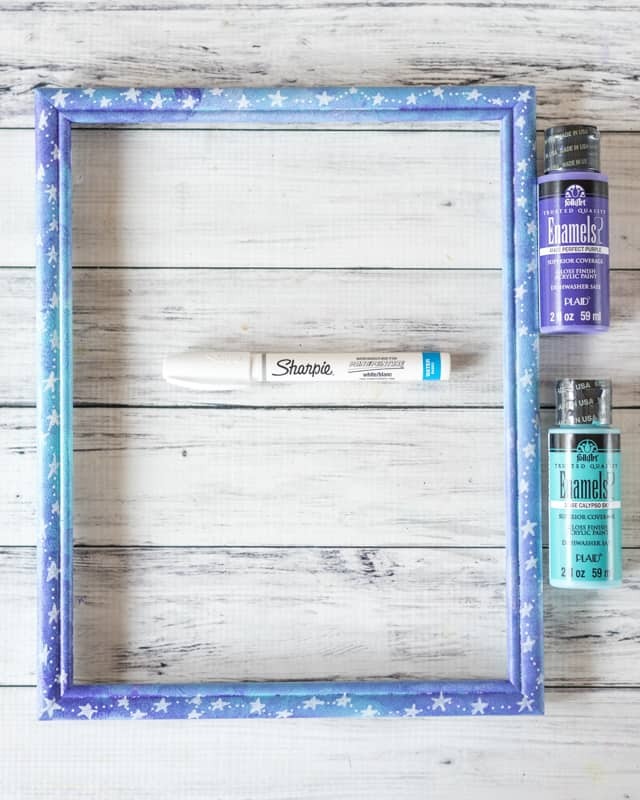 Spray paint is a quick and easy way to alter the frame. Remove the glass, then spray on some paint. 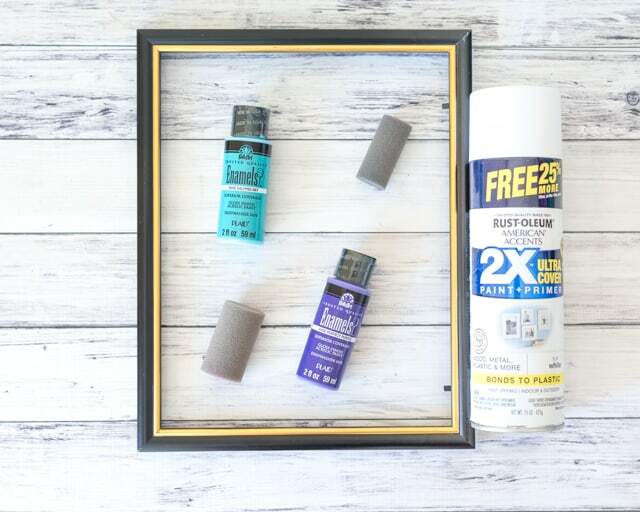 Leave your frame with a sleek, modern look from the white spray paint or grab some craft paints and keep decorating! I used the same purple and blue dishwasher safe galaxy mug tutorial and foam pouncers. Then I couldn’t help myself so I grabbed an extra fine Sharpie paint marker and added stars! Replace the glass once the paint is dry. Add your intentions planner and, voila! 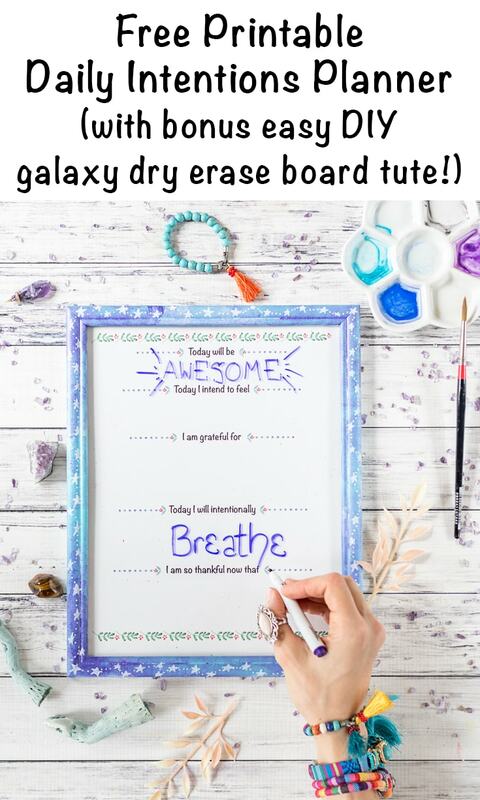 Instant DIY dry erase board that you can use over and over to plan and create the day you desire! It also works fantastically well as a dry erase daily planner. Just pop in your favorite daily planner sheet instead of the intentions printable! You can also use wet erase markers on the glass or even a Sharpie. I’ve found Sharpie marker is pretty easy to remove from glass without shadowing or staining. You can use nail polish remover, alcohol, or even another Sharpie. Write over top of your old letters with a Sharpie and then quickly wipe away with a paper towel! I’ve even scratched fresher Sharpie off glass with my fingernail, so you have lots of options if you decide to go that route! If you’re looking to create a more conscious, joyful life, then you may also enjoy learning about the Complaint Free Week Challenge. Even though I’m still working on becoming totally complaint free, I’ve experienced such a mindset shift and increase in happiness on the journey! What amazing day will you create using your new daily intentions planner printable?